Many of us remember the very young Midori of the 1980’s, thrilling us with beautiful performances of the greatest violin concertos. 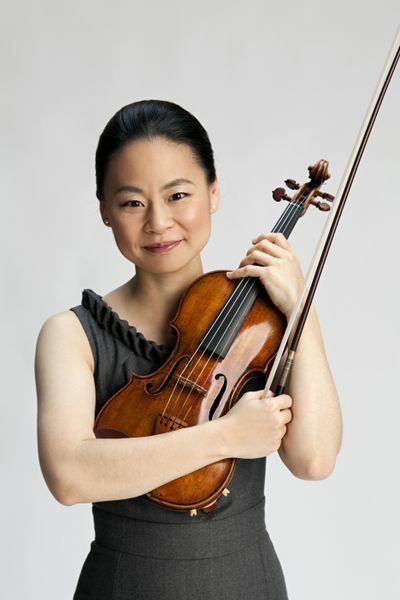 Her playing continues to excite us now, but being a celebrated artist on the international stage remains only part of Midori’s inspiration. From an early age, she was taken by a more general and selfless social concern: the power of music to reach out to the world and make it a better place. Since her early twenties, she has therefore worked to create ‘community engagement’ organizations that can introduce the joy of music and the empowerment of ‘music sharing’ to less advantaged communities and parts of the world, and children in particular. There are now four of these: Midori & Friends, Partners in Performance, Orchestra Residencies Program, and Music Sharing. Midori and Friends was established in 1992 to bring music to the disadvantaged in New York and Japan and has since blossomed into a full 26-week instructional program for school children. The other programs have provided initiatives for young artists, youth orchestras, and remote communities in the US and Japan, recently extending itself to Latin America and less developed parts of Asia. Midori herself participates and performs in many of these outreach projects. This year marks the 30th anniversary of Midori’s performing career. She is currently Distinguished Professor of Music at the University of Southern California where she holds the Jascha Heifetz Chair. She received her Master’s Degree in Psychology and Gender Studies from New York University in 2005. She was named Messenger-of-Peace by the United Nations in 2007 and received the prestigious Crystal Award at the 2012 World Economic Forum. In the following interview, we ask Midori to give us some insight into her unique inspiration both as a philanthropist and performer and her perspectives on important issues confronting classical music today. 1. Your humanitarian lead certainly has served to inspire a great many of us. Where do you think your inspiration originally came from? There have been a variety of people who have served as an inspiration for me over the years but there is no doubt what I originally learned from my family was a very important foundation. The theme was ‘invest in education’ and in some ways I have simply tried to carry that idea forward through my own decisions and choices. This focus can be regarded as humanitarian, but it is equally the idea of ‘community’ created through education and the power of music that attracted me. 2. It is now been 20 years since the founding of ‘Midori and Friends’ and you have expanded your community engagement activities even further in recent years. How do you personally assess your rich experience? I am simply grateful that I had this opportunity. Naturally, results vary widely over our outreach projects, as do the possible effects on the communities we visit. But it has been a wonderful learning experience. For example, I have found that sometimes the musical component actually turns out to be less important than the people we are meeting and interacting with. At the same time, I have learned the possibilities for beneficial community engagement are almost infinite in variety. For all I have achieved, there are so many things I have not tried or done. Above all, through these activities, I have learned so much as a person, and these experiences have really shaped me as a person. 3. ‘Globalization’ has already sprung some wonderful surprises such as the Venezuelan classical music renaissance (through Gustavo Dudamel) and seemingly allows a more egalitarian access to world musical resources. Broadly speaking, do you think globalization makes your humanitarian objectives easier to achieve? Absolutely. Today, classical music is more accessible than it has ever been before in history. The thought that music which, just a few generations ago, would never be heard outside of a small radius around its origin, can now be enjoyed in all parts of the world is wonderfully inspirational. In terms of humanitarian efforts, this is both a blessing and a challenge. I consider myself very fortunate to be able to travel throughout the United States, Asia, Europe, and South America for various types of outreach projects, and I know that these projects are able to reach a much broader group of people than they would have even a few decades ago. However, with increased access comes a greater responsibility to share the power of music. The work of a humanitarian in today’s world is never done! 4. A life of performance, teaching, philanthropy and travel has given you a vast personal experience by the age of 41. Is there any sense in which this experience has influenced your interpretations of the music you play? While my overall approach to performance and interpretation has not changed drastically throughout my career, it has nonetheless developed as a result of the experiences that I’ve had. One of the great joys that I experience as a performer is revisiting pieces that I have performed many times before and finding new musical meaning and interpretive possibility within them. In some cases, I’ll return to a piece after many years and will find that the intervening time has led me to see some things in a completely different way. In other situations, I may perform the same concerto with two different orchestras and conductors in the span of weeks; here, the collaborators, the venue, the intimacy of the audience, and many other factors may contribute to nuances that make these two performances differ considerably. Ultimately, each time I approach a piece, whether it is new or familiar, I try to bring the experience I have had as a performer and the individual aspects of the situation at hand together to allow me to best realize the composer’s intention. 5. I always wonder, with all your commitments: How do you find time to practice? Practicing has always been a personal time of introspection and focus for me. It helps to keep the other parts of my life balanced and in check. Though I may have more or less time to practice on any particular day, given my other projects and activities, I’ve found that it is the quality of the practice time, rather than the quantity, which is most important. I normally reserve morning hours as well as evenings for my own practice, including after performances. 6. There are so many young artists today who might benefit strongly from your example of career management, making strong social participation and humanitarian responsibility part of their role model? Do you think that musicians should work towards this? Each musician and artist is different. I would not automatically expect any musician to do things the way I have done them. What is right for me may simply not be right for them. And, equally important, the opposite holds. Nonetheless, it always makes me happy to learn about musicians who demonstrate commitment to our community through their artistry. I think that it is so important to be a part of our society through various means, and doing so through music is certainly one great way! 7. I sympathize with your inspiration to bring musical exposure and participation to the disadvantaged. But, truthfully, I have a problem even in getting my ‘advantaged’ university students to attend or appreciate the many distinguished classical music concerts we have here. The youth of today seem increasingly disconnected from classical music. What insights do you have on this problem? In my experience, the problem of the ‘disconnect’ you mention is not because people are incapable of appreciating classical music, but rather that they haven’t been exposed to it in an accessible way and from an early age. Those young students who participate in classical music studies are often receptive to attending concerts and appreciating classical music later on in life, even if they are not actively making music themselves any longer. This is one of many reasons that I believe that music education programs for students of all ages are vitally important.